Well, The Bachelor is still happening... even if it's putting most of our recappers to sleep. Between weird age differences and utterly boring dates, the roundtable still had a lot to say. So let's dive in! This week was a whirlwind of drama, with a lot of the episode focused on Bekah’s age. Arie clearly has a strong connection with her. How do you think the show handled the revelation and how do you feel about the pairing? Alisa: The whole thing was weird, but not just because of the literal age gap. Yes, to be perfectly honest, I do think there’s a bit of an ick-factor with the fact that she’s 14 years younger. I mean, he became a teenager before she was even born. So there’s that. But the bigger issue is that they’re at totally different places in their lives. Bekah seems super fun and lighthearted and ready to live her 20s to the extreme. As she should. Arie on the other hand is self-admittedly a cardigan-wearing grandpa who goes to bed before the sun sets. And that’s totally fine, too. But that makes a relationship hard when you’re not just two different people who grew up as part of two different generations — you’re also living two totally different types of lives. They do seem to have some intense chemistry going on but so do Arie and like five other women, so I’m not swayed by that. And let’s be honest — the fact that Arie is more freaked out by Bekah’s age than by Krystal’s BLATANT manipulations for time and attention is a real problem. He’s so convinced baby Bekah will break his heart because she’s 22 rather than worrying about Krystal who’s possibly a sociopath. Learn to prioritize your concerns, Arie. Rebecca: Alisa took all the words right out of my mouth. Age gaps don’t bother me so long as everything is legal and consensual, but this 14-year age gap is a little creepy just because of the setting: a reality TV show, competing against other women, some of whom are nearly 10 years older than you... the whole thing gives me some icky vibes, but I love Bekah and I trust her and her judgment. I agree that Arie has waaaay more important things to be worried about, like the fact Krystal is actually evil. Chelsea: Yeah, normally an age gap doesn’t bother me too much but he literally looks 25 years older than her, and is clearly in a different place of life than Bekah. My stepdad is 13 years older than my mom but the dynamic is way different. They’re on the same page of where they want to be and not on a reality show. It should be noted that Krystal is the only girl that is 30 years old left on the show. The average age of all the girls left is 26 ½, so Arie already has nearly a decade on his ladies. I think the problem really was they cast ladies for Peter’s season and ended up with an older Bachelor than what they had planned. Arie might still be in his twenties mentally (Bekah is clearly smarter than him) but he really needs to grow up. The group date was quite rough and a bit disgusting to watch this week. What were your favorite moments during any of the dates this week and what is your ideal date for the show? Alisa: My favorite part was Krystal trying to confront Tia and Caroline and them literally laughing in her face and calling her on her nonsense. I am so completely bummed that Caroline left this week because she was hilarious and I hope we see more of her in the Bachelor ‘verse. My ideal date for the show would be a girls-only date where all the ladies go to some amazing city and just explore for the day and Arie stays home and naps in his favorite cardigan and we don’t see any of him for the entire episode. Rebecca: Alisa, that is the kind of date I would go on! There seem to be a lot more friendships this season than normal, and I’m so here for it. Honestly, I had to Google what the group date was because I had forgotten, and I don’t remember who got the other one-on-one besides Bekah, so obviously none of them made a great impression on me. Chelsea: I’m so sad we’re not watching Tia & Caroline’s Happily Ever After, because those ladies were living their best lives on that dumb wilderness date. They both handled Krystal and her ridiculous confrontation about the group date like champs, and it’s truly tragic that Caroline went home this early. But also, girl save yourself from Arie. You can do better! On most other seasons, Caroline would be a frontrunner to win or for Bachelorette but now I’m hoping she gets a nice vacation in Paradise. I really don’t remember much of the dates besides the eating bugs and almost tricking them into drinking their own pee. That’s not romantic at all. 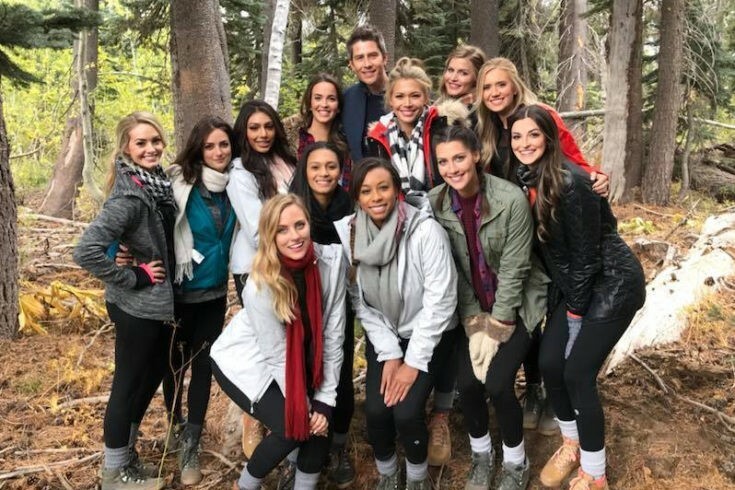 These group dates seem way too big to be productive and Arie is clearly not an outdoors kind of guy for them. Seinne had the only normal date of parasailing and dinner and making the most of her quality time. Another wonderful gal that is too good for this nonsense. Pretty sure Bekah’s date was just in a hot tub and just felt weird. My ideal date for the ladies would be them going out to brunch, with bottomless mimosas (obviously), a day of fun activities like shopping and mini golf, and ending it with karaoke. And Arie would be at home with Krystal and we wouldn’t see them, so it would be the best. Krystal was prime diva this week creating drama on the group date and during the rose ceremony. How much longer do you think she’ll last this season? Alisa: Well, I have her in my top four so I hope she lasts through hometowns because I need the points! She the worst but she is also one of the only entertaining parts of this season. Rebecca: I think she’ll get eliminated right before hometowns. That’s about the time when the true colors come out, and I have a feeling the other girls will make sure Arie finds out exactly who she is before he takes her to meet his family. Oh wait... she already did *eyeroll emoji*. Chelsea: I feel like Krystal could go home this next week if we’re lucky (sorry, Alisa). She’s not entertaining enough — like Corinne’s trainwreck — to make it to hometowns and there are still some really great girls in the game. I hope her little meltdown in the previews has her packing next week. I did LOVE when all the girls sat down during the rose ceremony after she snagged Arie. We saw a bunch of the women bonding this week on the show, particularly Tia and Caroline. Who are your favorite ladies at this point? Do any of them have Paradise or Bachelorette material? Alisa: I’d love to see Caroline and Bibiana show up in Paradise. I thought Chelsea was going to turn out to be a much bigger villain this season but she’s being outshined by Krystal. Maybe if Chelsea were to go to Paradise she could really let her villain flag fly. Becca and Bekah are both too sweet and good to be on this trainwreck of a franchise. Jacqueline has a hilarious Twitter account that I just discovered so I hope she shows up in Paradise and brings that sass to the screen. Seinne is amazing and way too smart and mature to be on Paradise. I’d be so excited if she was the next Bachelorette. You know, they really gave Arie a pretty fantastic bunch of women to choose from and it’s too bad he’s undeserving and going to eff it all up. Rebecca: I also really love Becca, Bekah, and Seinne! Bibiana was robbed and definitely deserves a shot at love in Paradise. I’d love to see Seinne as the next Bachelorette as well. Both the Beckahs (get it — Becca and Bekah?) are too good for the Bachelor franchise, but I love them both so much and hope to see Bekah in Paradise, since I think Becca will win. I’d also love to see Tia go to Paradise with Raven. Chelsea: I’m with Alisa in that I though Not Me would be more of a villain based on the premiere. There’s clearly footage of her trying to be villainous based on that last bumper but it clearly wasn’t big enough to make an impact. For the next Bachelorette, I would LOVE to see Caroline, Seinne, or Becca. All three of those girls are funny and smart enough to follow in Rachel’s footsteps. For Paradise, I really love a lot of the girls. I think Maquel and Bekah would thrive on the beach away from boring Arie. Justice for Bibiana getting sent home far too soon and Jacqueline for not getting enough screentime this year. And then of course Tia will take the snark master mantle from Raven and do great things on the beach. I just hope she has better taste in guys than Raven did in the end. Maybe Tia and Ben Z. can find love this summer?